January 2016 79 combined with steps, walls, and boulder outcroppings, create textural contrasts that attract humming birds and butterflies with their seasonal blooms. III. To unify the backyard with the home's interior. By integrating a classic bronze fountain near the home the formality of the interior design is married with the geometry of the backyard. Thus, the home flows effortlessly from the living room, out the backdoor, and down to the water's edge. IV. To draw the homeowner and guests out into the garden. To create a space that lures people in accommodations must be made for relaxing and lounging. In this design steps are built to be available for sitting; flat lawn areas double as "grass patios" for the occasional party; even the boulders are positioned to allow for alternative seating. V. To provide a beautiful view of the home. 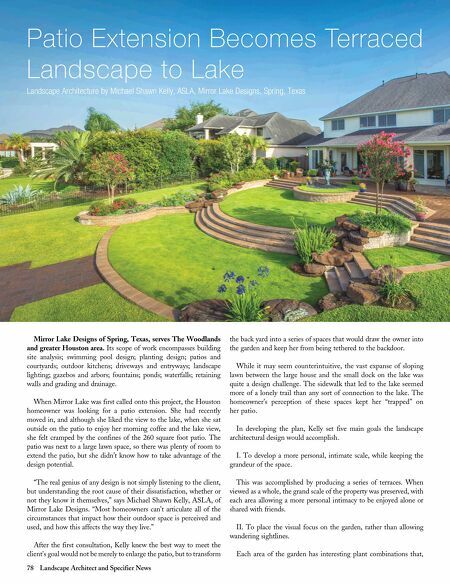 "The view back from whence you came is an element of good design that is often neglected," said Michael Shawn Kelly, ASLA. 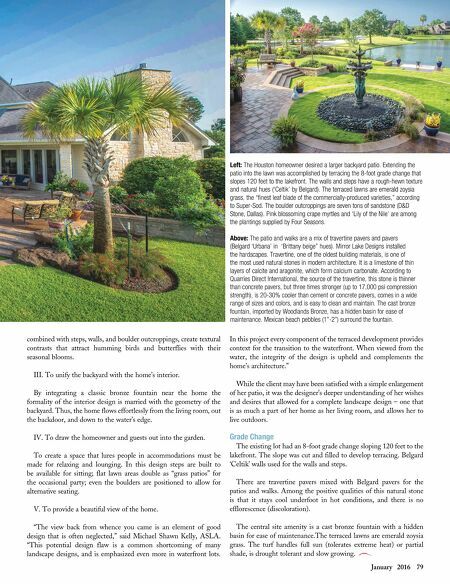 "This potential design flaw is a common shortcoming of many landscape designs, and is emphasized even more in waterfront lots. In this project every component of the terraced development provides context for the transition to the waterfront. When viewed from the water, the integrity of the design is upheld and complements the home's architecture." While the client may have been satisfied with a simple enlargement of her patio, it was the designer's deeper understanding of her wishes and desires that allowed for a complete landscape design – one that is as much a part of her home as her living room, and allows her to live outdoors. Grade Change The existing lot had an 8-foot grade change sloping 120 feet to the lakefront. The slope was cut and filled to develop terracing. Belgard 'Celtik' walls used for the walls and steps. There are travertine pavers mixed with Belgard pavers for the patios and walks. Among the positive qualities of this natural stone is that it stays cool underfoot in hot conditions, and there is no efflorescence (discoloration). The central site amenity is a cast bronze fountain with a hidden basin for ease of maintenance.The terraced lawns are emerald zoysia grass. The turf handles full sun (tolerates extreme heat) or partial shade, is drought tolerant and slow growing. Left: The Houston homeowner desired a larger backyard patio. Extending the patio into the lawn was accomplished by terracing the 8-foot grade change that slopes 120 feet to the lakefront. The walls and steps have a rough-hewn texture and natural hues ('Celtik' by Belgard). The terraced lawns are emerald zoysia grass, the "finest leaf blade of the commercially-produced varieties," according to Super-Sod. The boulder outcroppings are seven tons of sandstone (D&D Stone, Dallas). Pink blossoming crape myrtles and 'Lily of the Nile' are among the plantings supplied by Four Seasons. Above: The patio and walks are a mix of travertine pavers and pavers (Belgard 'Urbana' in 'Brittany beige" hues). Mirror Lake Designs installed the hardscapes. Travertine, one of the oldest building materials, is one of the most used natural stones in modern architecture. It is a limestone of thin layers of calcite and aragonite, which form calcium carbonate. According to Quarries Direct International, the source of the travertine, this stone is thinner than concrete pavers, but three times stronger (up to 17,000 psi compression strength), is 20-30% cooler than cement or concrete pavers, comes in a wide range of sizes and colors, and is easy to clean and maintain. The cast bronze fountain, imported by Woodlands Bronze, has a hidden basin for ease of maintenance. Mexican beach pebbles (1"-2") surround the fountain.